This is a much delayed blog post (apologies for the silence) – I finally had the time and the courage to write up on my macro adventures in the summer. Just before the end of first year, I got an end-of-term treat to lots of dragonflies and damselflies in Somerset. We started at 2am from Penryn and arrived at RSPB Ham Wall Nature Reserve in Somerset at around 5am – early enough to see the Four-spotted Chasers climbing up the reeds to dry out and warm up in the rising sun. Blue-tailed damselflies were also around and actively hunting down prey once they have warmed up. It was quite a shock for me to see their incredible speed and precision when catching the prey mid-air! It was a pretty overwhelming experience for me as I have never seen such many dragonflies and damselflies clustered in one place in my life. Sightings that day: Four-spotted Chasers, Broad Bodied Chasers, Scarce Chasers, Black-tailed Skimmer, Hairy Dragonflies, Emperor Dragonflies, Blue-tailed Damselflies, Variable Damselflies, Azure Damselflies, and Common Damselflies. In Britain, there are 21 recorded species of damselflies (suborder Zygoptera) and 36 recorded species of dragonflies (suborder Anisoptera); 17 damselflies and 25 dragonflies are resident breeders, and the remaining are vagrant or extinct. The biggest threat to dragonflies and damselflies comes from loss of aquatic habitat, water pollution, changes in land management and urban development. We also saw a few butterflies around Somerset, including Common Blues, Green Hairstreaks, Dingy Skippers as well as Grizzled Skippers. I found that Common Blue Butterflies like to adopt this head-down roosting position as sunset approaches, and the Green Hairstreaks were easy to spot due to their flashing green wings but extremely hard to photograph as they were quite sensitive. To wrap up the bank holiday weekend adventure, we headed to Dartmoor for waterfalls, where the guys decided to go for a little swim (a rather chilly one), and we finished off with posh pasties (with a knife and a fork!) for lunch before the long drive back to Falmouth. A few days later, before sunset, we headed to the sand dunes near Parrenporth and found several colonies of Common Blue and Silver-studded Blue Butterflies roosting. The Silver-studded Blues (Plebejus argus) are probably one of the prettiest butterflies I’ve seen. As indicated by their name, there are light blue reflective studs on the underwings of adults. 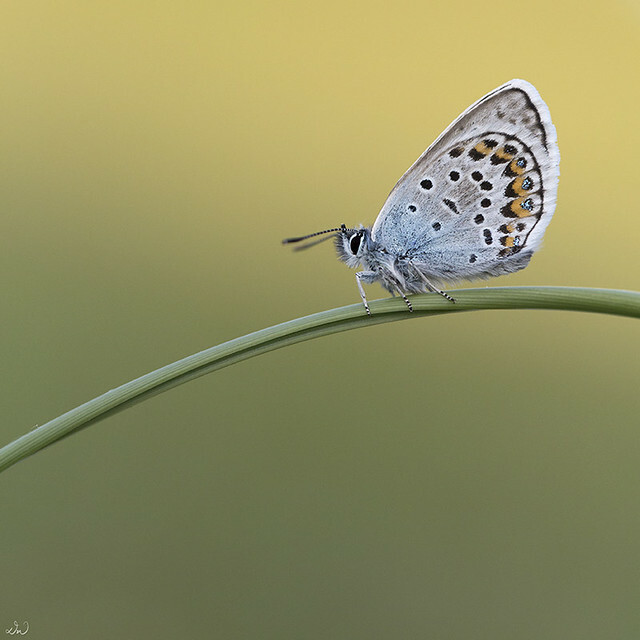 Silver-studded Blues are quite rare and are restricted to heathland habitats. Their numbers have suffered a major decline in recent years due to habitat fragmentation. Watch this space for more photos of butterflies, dragonflies and damselflies – part two of A Summer Flutter will be published soon! That first photo (silhouette) is absolutely stunning, and the rest are brilliant also. Fantastic collection!